TortoiseForum.org - Enjoy these lovely pictures of two young Russian tortoises waking up and going about their day doing what tortoises do. Their “older brother” Brains has a handsome cameo appearance as well. TortoiseForum.org - A young, handsome hypo redfoot tortoise has to work at catching an elusive cherry tomato in this lovely series of photos from The Tortoise Cove. 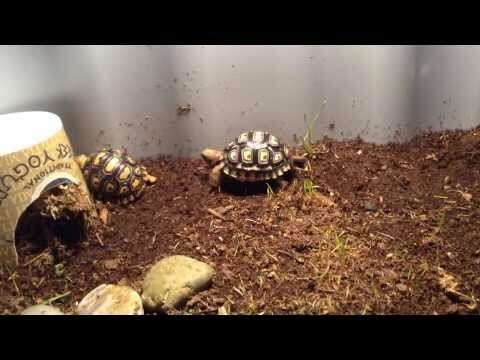 YouTube - Enjoy a quick and amusing video of a baby leopard tortoise with some impressive tumbling skills. Ball-Pythons.net - Check out some cool pictures of some hot ball pythons putting together their own rock band! Caudata.org - This is an older thread recently revived, filled with beautiful pictures of a remarkable aquarium and its cool critters. Reptile Insider - A grumpy boa constrictor with cinnamon coloration and its much lighter sibling tolerate the camera’s presence. Mostly.